STARKVILLE, Miss. -- A commitment to improving public health issues in Mississippi has brought David Buys to the presidency of the organization dedicated to similar goals. 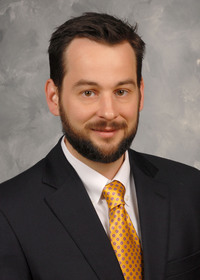 Buys has been the health specialist with the Mississippi State University Extension Service and assistant professor in the Department of Food Science, Nutrition and Health Promotion since 2014. He has served on the board of directors for the organization for the past three years before being named president-elect in 2017. He was installed as president of the Mississippi Public Health Association at their annual meeting on Oct. 19. MPHA works to improve the education and status of public health workers and advocates for policies to improve the health of Mississippians. Charles “Buddy” Daughdrill, MPHA executive director, said Buys’ background and current efforts to improve public health in Mississippi is a good fit for the association. Buys said the association partners with other groups, such as the American Cancer Society, as they advocate for legislation that would discourage tobacco use. After earning a bachelor’s degree in sociology from Mississippi College, Buys received a master’s degree in sociology from Auburn University and a doctorate in medical sociology from the University of Alabama at Birmingham. He earned a graduate certificate in gerontology and a master’s degree in public health from UAB, where he completed a postdoctoral fellowship in health services and outcomes research funded by the Agency for Healthcare Research and Quality and National Institutes of Health.